Contemporary Quilting Speaks to Me! I live in rural central Pennsylvania, traditional quilting central. We have quilt guilds in just about every county and a bounty of beautiful Amish quilts from our German heritage. Sometimes to merely suggest designing and creating contemporary quilts feels almost sacrilegious. But contemporary designs just speak to me! Recently I tried to communicate my passion, interest and some techniques to an audience of traditional quilters. I did a workshop entitled “The Wild and Wonky World of Contemporary Quilting”. Delicately I shared that I just didn’t want to make 30 or more blocks all the same which then needed to be carefully sewn together to create a particular pattern. In fact, I didn’t want to use patterns….or pins much. Nor did I want to know exactly where I was going to end up when I started designing a new quilt. I discussed how exciting it is to work with colors and curves (I’m partial to sewing curved piecing) and basically to paint with fabric. And how I have learned to sharpen my observation skills and think about ways to convey a picture or a photograph or just a design with fabric and quilt stitching. I talked about having over 500 pieces of fabric, organized by color and the hours of just playing with my fabric, combining different colors. There are feelings that colors illicit and there are no better days than the ones when ideas are just starting to form, when I play all day pulling out fabrics and thinking about them together, imagining if they could possibly become a beautiful quilt. I have tremendous respect for traditional quilters who in my view have much more patience and probably sewing skill than I do. But traditional patterns and designs, the sharp edges of blocks carefully lined up, it just doesn’t excite me. At age 60, going on the rest of my life, I want to spend my days doing things that excite and bring joy. Designing and creating contemporary quilts fills my days with endless options and experimenting. I give myself permission to try something different. And to accept that all my efforts are not worthy of being displayed but they all teach me something. At age 60 I want to keep learning, keep expanding my quilting problem solving, keep trying to recreate the colors and intensity and feelings of last night’s sunset or the picture of a wild flower sent by a friend. 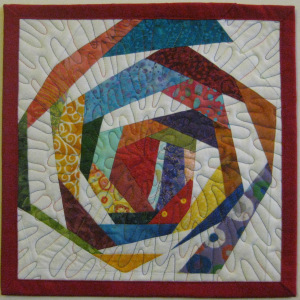 I want to make quilts that brighten walls and bring smiles to your face. I want to make quilts in which you find something new in them, months after you first hang them up, a new fabric or a new shape or a new color combination. So for those of you thinking about exploring the wild and wonky world of contemporary quilting….go ahead and dive right in!! I tell people to take all the pictures they want of my quilts at festivals. I would be honored if they found a design or a technique they could use in their own new quilting efforts. I’m nearing fifty, and I feel much the same. I’m relatively new to quilting, but after a year of playing with patchwork, I want to explore other methods of creativity. I’ve only been reading your blog for a couple of months, but I find such beauty in your pieces, so thanks for sharing your art and joy! I’m so glad to hear from you and to learn my quilts and my blog may encourage you to explore contemporary quilting. Thanks for sharing and stay in touch! My daughter is expecting in July 2019. She is an artist and very into color. Her baby room is inspired by her latest trip to New Mexico. She loves the reddish, tan, yellow colors for a more contemporary quilt. purchased in New Mexico. She will be hanging the striped blanket on the wall of her baby room. Can you give me advice? Can you make such a blanket in a baby size? IF not, do you have any suggestions? This is my first grand baby and I want to wow her. Thank you for your question. I could make you a baby quilt but my piecing is usually more intricate than a typical baby quilt. Because I make pieced quilts, my use of circles is usually as half circles as it is impossible to piece in a full circle. I think your idea is a good one, to have a baby quilt with circles or curves to blend with the stripes of the blanket on the wall. I love these colors as well. I would suggest looking at Pintrest for ideas. My approach would be to design a fairly large design of curves in the colors you mentioned. You can check out some of my quilts with curves on this website and also in my Etsy store. For a baby quilt, I would make the design larger and less intricate with regards piecing so that it would be softer and not as stiff. Once you give me a design idea, I could give you a price.